If you work in art in any capacity, you NEED a primer on art science. Everyone is freaking about about forgery these days. Hah, right: everyone has been freaking out about forgery always. The art market depends on assertions of authenticity; validations result in high valuations. Authenticity is the only thing that separates a $50mil Rembrandt from a $20 canvass with some paint on it. Art buyers want “real” and are prepared to sue the trousers off anyone who sells them “fake”. Science, Science to the rescue! Maybe. 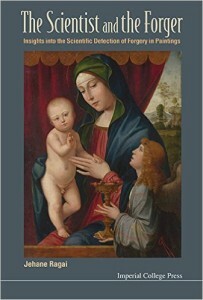 Jehane Regai’s stated goal in this book is to provide clear summaries of the various modern scientific techniques used to determine if a painting is not what it appears to be. These descriptions are meant for the interested public but perhaps not the lay public. The book is for people engaging with art professionally, academically, or financially but who are not scientists themselves. Her discussion of techniques will likely seem a bit simple to scientists and, conversely, are a bit challenging to the non scientists. Thankfully for those of us who fall into category 2, case studies are offered with each technique that allow for an understanding of application, advantages and drawbacks. The author presents an ideal where science, art historical research, and connoisseurship are combined to produce a robust profile of any artwork being investigated. She discusses each with respect, offering cases where the different fields compliment each other. She urges scientists and connoisseurs not to fight. That said, it is hard not to see connoisseurship as the weak link in that trifecta and, as such, I can understand why connoisseurs are down on science: science kinda rubbishes the connoisseurs entire existence. So connoisseurship, defined as being able to ‘feel the oeuvre’ of an artist and ‘having the eye’ and thus being able to authenticate artwork, is 100% subjective. It is the product of a confluence of two things: 1. The historic need for authenticity (see above); 2. The desire for artistic greatness to exist not just in the creators but the consumers… in other words the self-serving motivation to assert that love of art is itself an art. Thus a connoisseur determines of an artwork is real or fake by…having an opinion about it. This is me talking, not Regai. I can’t help rolling my eyes whenever I hear that someone has “the eye” in the art world. “Eye my foot” I tend to think. Connoisseurship seems built on a bed of hubris…and so many connoisseurs seem to fly far too close to the sun. In this metaphor the sun is science which melts their connoisseur wings, sending them plummeting to the earth. When “I feel in my magical gut, in my connoisseur’s eye that this is a Vermeer” is challenged with “Umm, none of these pigments date to Vermeer’s day” this becomes a challenge to the connoisseur’s authority and standing. Once on a pedestal pretty much because they were the only authenticator shop in town, connoisseur are seeing themselves replaced by Scientific tests. And indeed Regali warns against this. In The Scientist and the Forger she offers several examples where connoisseurship is key to, well, showing an artwork is fake or real. But that, in itself, bring us to an interesting question about science. Can science AUTHENTICATE art or can it only INVALIDATE forgeries? In other words can these techniques tell us what is real, or can they only detect fakes that have mistakes in them? Weird flowers? X-ray Van Gogh Boxers! The author uses an example over and over again of an out-of-character Van Gogh that folks thought was a fake. X-rays, however, showed that beneath the weird flowers was another Van Gogh painting, one of boxers that he wrote about in a letter to his brother. Ta-da, science shows that the painting is a real Van Gogh, right? Not really. The interpretation of the results was entirely dependent on art historical research that tied Van Gogh to the boxer subject. Without that, it’d just be an underpainting. 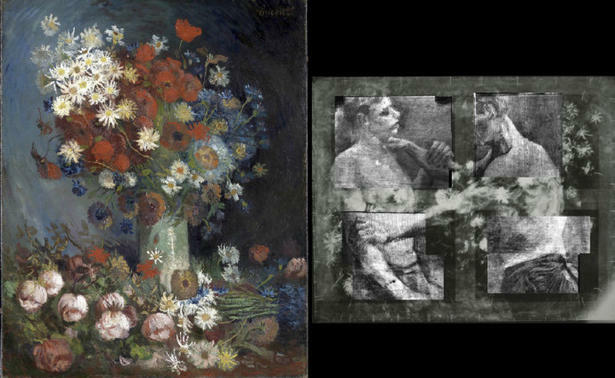 Indeed, heck, it might be seen as an indication of the fakeness of the painting: the idea that a forger took an old canvass and Van Gogh’d over the top of it. Sorry science. Let’s think of an extreme example. Say I’ve been able to extract DNA from Leonardo’s remains (questionable in every way). Say I have a painting that is a suspected Leonardo. All of the pigments date to the right time period. It is aged appropriately. It is painted on ol’ Leo’s favourite type of wood slab. Finally, I am somehow able to extract some DNA off the thing and it matches what I got from his body. Do I have a piece painted by Leonardo? No. I might have a painting that his student or partner created, at Leonardo’s crib, that Leonardo interacted with (or got hair on, or bled on, I dunno. This is hypothetical). I know the painting was touched by greatness but I don’t know that greatness painted it. 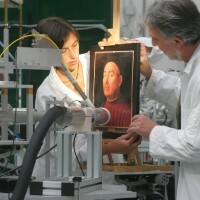 So really, at least in the case of paintings, it seems that these scientific techniques can only conclude that a piece has no anachronistic elements, not that it is “real”. This doesn’t me that I am calling the connoisseur, however. No, this means I am calling the art historian. What does this mean for the art buyer? Well, if you are buying high-cost artworks without a combo of proper scientific tests from reputable labs and intense provenance research from top quality art historians, you’re really dumb. Really, really dumb. You are pretty much the dumbest. Trusting a dealer or an auction house is crazy: their job is to make money off of you. Reputation, schmeputation. Just look at the Knoedler case. Trusting only your dealer’s science or provenance research is certifiable (ha). You wouldn’t buy a house without an independent appraisal, why on earth would you buy art without one? Next, trusting only a connoisseur is just wild. You are essentially paying someone to have a feel about the artwork in question which they will wrap in some “the eye” stuff that is, more or less, art market mythology. Spend your cash on some solid science and and a crack provenance research team, and make sure the two work together. As an added bonus your provenance people will likely be able to head any “stolen art” problems off at the pass too. Really, though, I doubt anyone reading this blog is buying into the high-end art market. If you are, would you like to make a donation to a registered charity (my Uni) so that I can continue to do spiffy art crime research? EMAIL ME! For the rest of us, how about this book. Who should read The Scientist and the Forger? If you are an art scientist, don’t bother. You are way beyond this. Do give this book a read, however, if you are involved in any other are of art: anything from research to collecting. As non-scientist archaeologist, I’ve always felt that ‘sending samples to be tested’ was magical. Away the obsidian goes and in a few weeks time, back comes info about the exact lava flow that the obsidian came from. Then I get to imagine the whole Maya river trade route that allowed the piece to be deposited where I found it. I just accept the results. I trust the lab I sent it to. But this is dangerous in the art world, especially if you are trying to evaluate results that you didn’t commission. You need to know what is going on when it comes to art science, and this book is a reasonable introduction to it. The next time I read in an article that a painting was subjected to X technique, I will certainly read that section of The Scientist and the Forger again so that I better understand the scope and the limitations of the results I am presented with. You’d be remiss if you didn’t do the same. P.S. Many of the images in this book were remarkably poor quality. Blurry line drawings and pixilated images. Not. Cool. The publisher should have caught the problems before the book was printed, but seriously academics: watch your stuff. WATCH IT. Stop right now and educate yourself on image publishing NOW. This analogy pretty much had to happen. I am writing this review from Crete.